YIP.4.4 – decluttering, in process, originally uploaded by earthchick. Thanks for all the fantastic craft organization suggestions. Keep them coming! (if you want to enter the giveaway, though, please make sure to comment on that post, not this one). I want to give you a little glimpse of how things currently look, at least on one side of the room. I put this Expedit bookcase from IKEA up in September, but it has taken me months to finally get it somewhat organized. (I *love* the Expedit. I have another one – 2×4 in this same room, and two more in the boys’ room – a 2×4 and a 4×4. Their room is tiny, and the Expedit offers a versatile way to store a lot of stuff. 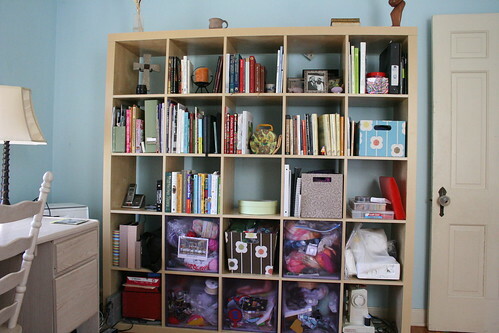 I use their bookcases for books, toys, and even clothes [using drawer inserts that you can also buy at IKEA]). Click on the picture to see full notes about what is on which shelf. It’s a start. The truth is that most of my yarn lives elsewhere, as do most of my sewing books and about half of my knitting books. I also have at least half my fabric stored in the basement, and another assortment in my bedroom closet. But what I am currently using or about to use (or have delusions or using soon) is all in this room. I utterly covet the Expedit shelves! Specifically the 6×6. It would completely fill one wall of my … let’s call it an “office” and I could get everything. Off. The floor. No way it would look as pretty and put together as yours does, but i imagine it that way! PS Your walls are beautiful too.